A proposal to store nuclear waste below the Canadian shore of Lake Huron has drawn high criticism from environmental advocates. 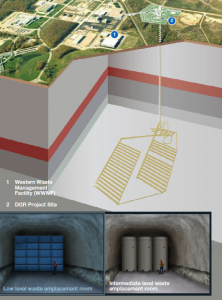 Ontario Power Generation is seeking federal approval to build underground facilities to store low and intermediate level nuclear waste produced by the Pickering, Darlington, and Bruce nuclear plants. 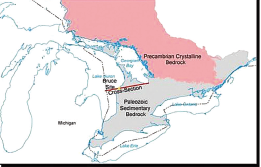 The storage facilities would be built 2,230 feet below the ground and about mile away from Lake Huron near Kincardine and on the site of the Bruce nuclear power plant. It would hold about 200,000 cubic meters of waste. Low and intermediate level waste include discarded supplies, resin and filters that are highly radioactive, despite classified as having intermediate level of radioactivity, said Debra Myles, co-manager of the Deep Geological Respiratory Joint Review Panel. The Canadian Nuclear Safety Commission and the Canadian Ministry of the Environment created the Joint Review Panel to conduct hearings and discussions on the environmental impacts of the project. It will consider the effectiveness of engineered and geological barriers and the reliability of computer modeling of safety predictions. The idea for the permanent storage of the waste came from Kincardine officials, said Berry. Such waste is now temporarily stored above the ground at the Bruce nuclear plant site in Kincardine. Supporters say the concept relies on multiple natural barriers, combining engineered containers and the rock formation to safely store the waste while the radioactivity decreases. “We chose the site because it has a stable rock formation of over 450 million years. It is extremely dense and we expect it to remain like that for another million years,” Berry said. But opponents argue that eventually the waste might escape the repository. Kay Cumbow, spokesperson for the Blue Water Sierra Club, a Michigan-based environmental protection group, said there could be safety hazards. The threat is long-term, she said. Cumbow noted that some radioactive substances are very long lived, and that the threat will last for many thousands of years. The waste must be isolated from the food chain for as long as it is hazardous, she said. That is difficult to guarantee, especially since the containers for high-level waste are only guaranteed for 100 years, she said. According Ontario Power Generation the radioactivity in the low —level waste will decay within about 300-400 years but the intermediate—level radioactivity will remain thousands of years. Brennain Lloyd, project coordinator at Northwatch, a coalition of environmental and citizen organizations in Ontario, agrees with Cumbow. “It could serve as a dangerous precedent, becoming the poster child for other nuclear waste burial schemes,” Lloyd said. OPG said the site has the lowest earthquake frequency in North American continent and there are several examples of such facilities operating safely in the United States, Finland and Sweden. The Joint Review Panel is collecting public comments on the project until August but it most likely will extend, said Berry. Pingback: A waste-eating bug for nuclear power? | The Truth is Where? It is imperative to all human’s and living beings that we have drinking water for absolute survival! This is not something we can reverse once it is done. It completely risks the 40 million human lives and could devastate all fauna and flora that rely on the lakes water for sustenance.Please do not allow this to happen, I grew up swimming and fishing in Lake Huron and it needs to be preserved for future generations. Also for all the people saying that it is safe I urge you to please research all of the many nuclear waste leaking into water. For example Japan admitting that there is 300 tons of nuclear waste leaking into the Pacific Ocean. Humans continue to prove that we mimic parasites. The Earth is our host and we consume until we destroy! I wonder: isn’t it additionally risky to choose a site that is so close to the lake shore for long term storage/burial of radioactive waste? Wouldn’t a leak ruin the drinkable waters of Lake Huron and everything downstream? I think there are six nuclear fission reactors currently active on the shores of the Great Lakes- which are humanity’s planetary-jewels of freshwater. Juts to put the risk in its true context I work daily in nuclear facilities (and have worked at many sites) – in spite of this by far the most dangerous thing I do every day is to get in my car and drive to work. I suspect large numbers of you are in just as much danger as I am every day! To close, I would suggest that it is far better to put the waste in isolation from our environment than to store it indefinitely on the surface where it is definitely at risk from human intervention – accidental or otherwise. Easy to say … explain how? Thanks to the reporters who wrote regarding this critical issue that is largely hidden from the public’s sight. The atom was doing it’s job just fine until we figured out how to bust one.